Jumpseating, a Perk Allowed for Employees. What is it? Naturally one of the perks of being a flight attendant is the flight benefits. A friend of mine moved to Regina last summer and tweeted me at my TheseGoldWings twitter account* mentioning I had YET to visit him there. My plans this winter were to hold layovers in Regina and visit a few times per month. Unfortunately my upgrade to Cabin Manager this season has resulted in my sitting on reserve since January. I haven’t even flown in over a month. As such, I’ve had no opportunity to layover in Regina. With that in mind I replied to my friend “I wonder if I can jumpseat to Regina on a day off” and then went into our system to see what was flying in and our of YQR on my off days. Jumpseating at my airline is pretty simple: We agree to work a flight for free as an extra crew member on board, and in exchange we don’t have to pay anything at all to fly where we want to go. 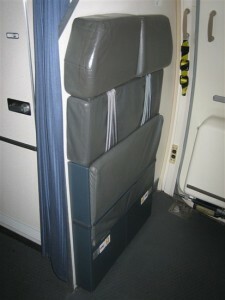 To request a jumpseat we need to submit an email to the company the week before we want to travel. On the Friday of that week, someone in Toronto reviews all the requests and approves or denies them based on if they meet the requirements for operating crew. As long as we meet the legal requirements (things like minimum crew rest) we get a response stating the jumpseat is approved and they send us the authorization form needed to board the flight. Getting the approval to fly is no problem generally. My setbacks usually lie with my company’s business model. We’re a vacation charter airline. We don’t fly to Regina. Not from Vancouver anyway. I figured to visit my friend I was going to have to work my way down to Cancun or something, and then work my way up to Regina. But I got lucky! After a little digging through the schedules I found that once a week my airline is operating a double stop. Vancouver – Regina – Montego Bay. What more? The plane does a turn around the same day. Montego Bay – Regina – Vancouver. And on top of that? There was a day where it was operating right smack in the middle of a 3 day off period in my schedule, and it was also a day off for my friend in Regina. Everything lined up for me to take a day trip to the prairies! I sent in my request asking to jumpseat to Regina on the flight in the morning, and then rejoin the aircraft that night to go back home. When I got my response I was originally denied my return flight because they misread my schedule and thought I didn’t have enough crew rest after getting back into Vancouver. After some quick emailing back and forth I was able to get that cleared up though and they approved my return flight. The very next week I took off for Regina and met up with my friend for the day. Admittedly if I worked for a larger airline it’d probably be easier to get to places like Regina. But as long as I stay creative, I can usually find a way to make it happen anyway.